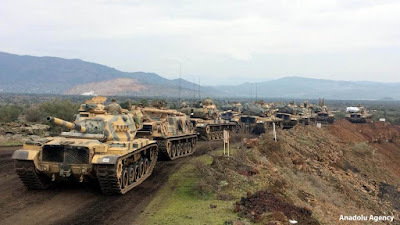 Middle East Perspectives by Rick Francona: Turkey - Operation Olive Branch: how far will they go? 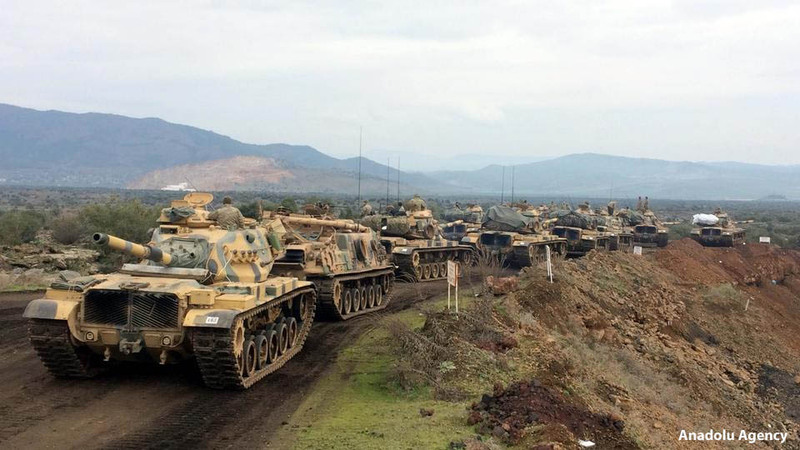 Turkey - Operation Olive Branch: how far will they go? First - and remember this as we go through this - for Turkey, it's about the Kurds. Turkey's perceived national interest in Syria has always been about the Kurds. I will only talk only briefly about the background, because most of you who read my writings are very familiar with the intense animosity between the Turks and the Kurds - and that means any Kurds, be they resident in Turkey, Syria, Iraq, and even Iran. I can somewhat understand the Turkish position - they have been fighting an insurgency against the Kurdish Workers' Party (Partiya Karkerên Kurdistanê, PKK) since 1984. The casualties and costs have not been insignificant. Over 5,000 Turks and 35,000 Kurds have been killed, and millions of Kurds have been displaced. The monetary cost to the Turkish government is estimated to be between 300 and 450 billion dollars. I have been in Turkey many times, have discussed this with Turks and Kurds alike, and still have friends and contacts among both. The Turks view their military as their own sons, very much as the Israelis do - both have universal conscription, so virtually everyone serves. In 2012, I was in Turkey when the PKK killed 22 Turkish soldiers in a series of attacks near the Iraqi border. The reaction among average Turks was palpable, like losing a cousin. It registered with me - the Turks take their losses to the Kurds personally. Rather than cowering the Turks, it strengthens their resolve. I was on CNN International earlier this week. I remarked that what Turkish President Recep Tayyip Erdoğan is doing in Syria resonates with much of the Turkish electorate, particularly those in Anatolia. They support his hard-line stance and what they perceive as a proactive operation against a potential future threat: fight the PKK in Syria rather than having to fight them here in Turkey. That's fine, if you buy into the Turkish assertion that the PKK is synonymous with the Syrian Kurdish Democratic Union Party (Partiya Yekîtiya Demokrat, PYD) and its militia known as the People's Protection Units (Yekîneyên Parastina Gel, YPG). While I take the point that the YPG and PKK have cooperated against Turkey in the past, much of that cooperation has been at the behest of the Syrian government. The Syrians and Turks have had major issues for decades over border security, and probably more importantly, the amount of flow of Euphrates River waters. The PKK has been designated as a terrorist group by the United States, NATO, and technically by the European Union. It is listed as a Proscribed Group by the United Kingdom. The United Nations has not listed them as a terrorist organization. Only the Turks regard the YPG as a terrorist group. The Turks are now seven days into Operation Olive Branch. They have virtual control of the airspace over 'Afrin canton, overwhelming firepower that state armed forces can provide, and almost complete encirclement of the alleged enemy, the so-called "terrorist" forces in northern Syria. Militarily, there is no doubt that the Turks could take over the entire 'Afrin canton area. Unfortunately, there is little recourse for the United States. Although the YPG is arguably the most effective partner in the Syrian Democratic Forces (SDF), the alliance of Kurdish, Arab and even Assyrian militias supported by the United States in the fight against the Islamic State in Iraq and Syria (ISIS), there was virtually no ISIS presence in the 'Afrin canton, thus little SDF ground operations and accompanying American support. 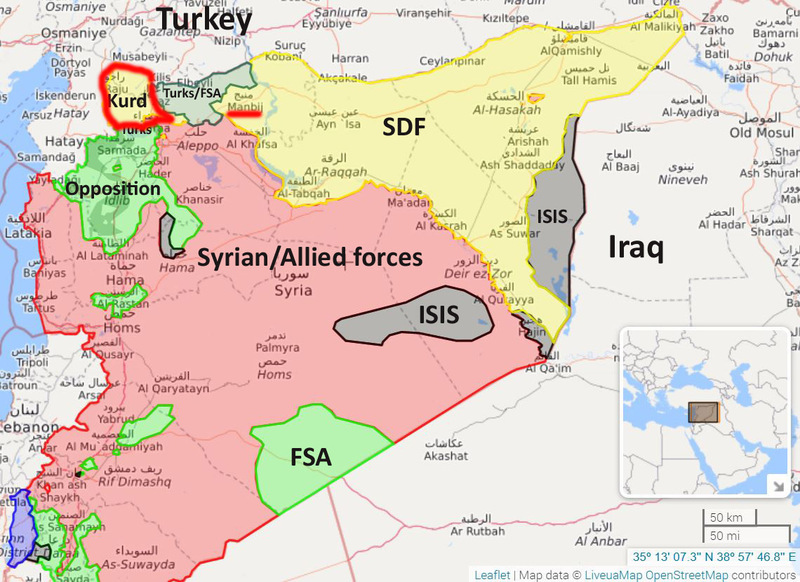 In August 2016, fearing the establishment of a continuous Kurdish-controlled area along the entire Syrian-Turkish border, the Turks launched Operation Euphrates Shield (dara' al-furat). While the stated goal of the operation was the eventual liberation of the ISIS self-declared capital of al-Raqqah, it was evident that the real goal of the operation was to split the Kurdish area into two pockets. The Turks never came within 100 miles of al-Raqqah, and were essentially marginalized into a pocket between Kurdish forces to the east and west, and Syria forces to the south. It is important to note that the YPG and/or the SDF have no real fight with the Syrian government in Damascus - they are focused on the fight against ISIS. Now the ISIS has lost almost all of its territory in Syria (and Iraq), the Turks are making their move to eliminate the YPG, first in 'Afrin canton. The question is, after they accomplish their objective, will they turn their attention and their quite capable military forces to the east, areas under the control of the American-backed SDF. 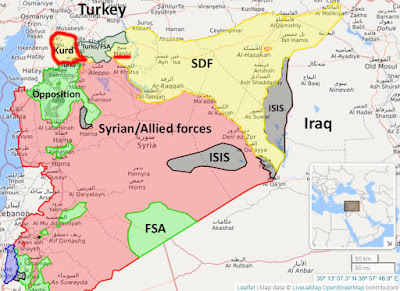 We should also remember that there are about 2,000 American forces on the ground in these areas to the east of Turkish Operation Euphrates Shield forces. “With the Olive Branch operation, we have once again thwarted the game of those sneaky forces whose interests in the region are different. Starting in Manbij, we will continue to thwart their game. We will clear Manbij of terrorists ... No one should be disturbed by this because the real owners of Manbij are not these terrorists, they are our Arab brothers. From Manbij, we will continue our struggle up to the border with Iraq, until no terrorist is left." Manbij is currently held by the SDF - the force there is a mix of Arabs, Kurds, and Assyrians. There are also American forces present in the area. There was initial thought that the Turks would attempt to secure the area held by the SDF in the Manbij area as far east as the Euphrates River, almost an undeclared boundary between the Turkish-back FSA (now calling themselves National Forces) and the SDF. Erdoğan's words suggest otherwise, that the Turks are not going to stop their eastward push at the river. The Turkish president is also on record that he wants to establish a "security zone" of 30 kilometers (18.65 miles) inside Syria along Turkey's southern border. His plans are not without precedent. In the past, the Israelis have done the same thing inside Lebanon, and the Turks themselves have done so in northern Iraq in the 1990s. However, this brings the Turks, a nominal NATO ally, into direct contact with not only the American trained, supported, and equipped SDF, but American troops as well. Do the Turks want to place themselves in a possible direct armed confrontation with American forces, another NATO member? While I hope that both sides continue talking (initial talks have not gone well), it is not helpful when President Erdoğan refers to his NATO allies as "crusaders." Would he bristle at being called an Ottoman or a Saracen? Another major unknown: Is the United States willing to risk a direct confrontation with a NATO ally over a commitment to a group of Syrian Kurds? The Kurds are wary of the Americans, for good reason. They believe the United States has abandoned them in the past, as far back as 1975. After entering into a virtual alliance with the U.S.-led anti-ISIS coalition, the SDF - primarily the Kurds - acquitted itself well on the battlefield. By most accounts, they were the most effective fighting force on the ground against the group, and were key to the reclamation of almost all of northern Syria from the group. Senior American officials have indicated a desire to maintain American forces in northern Syria in support of the SDF until there is a political solution to the Syrian civil war. To provide some stability to the recently "liberated" area, the United States is reportedly training a "border security" force of almost 30,000 fighters drawn from the SDF. A major task for this force will be not only to prevent jihadists from entering Syria, but more importantly, preventing ISIS fighters from leaving and returning to their home countries and mounting terrorist attacks. Predictably, the Turks have objected to this plan. They claim that there is no need for such a security force. Perhaps Mr. Erdoğan could explain how tens of thousands of jihadis entered Syria via Turkey over the last three years. It was the major route to join ISIS. I have been on both sides along most of the Syrian-Turkish border - it is well-marked and well-defended. Passing through that border would be difficult without someone turning a blind eye. 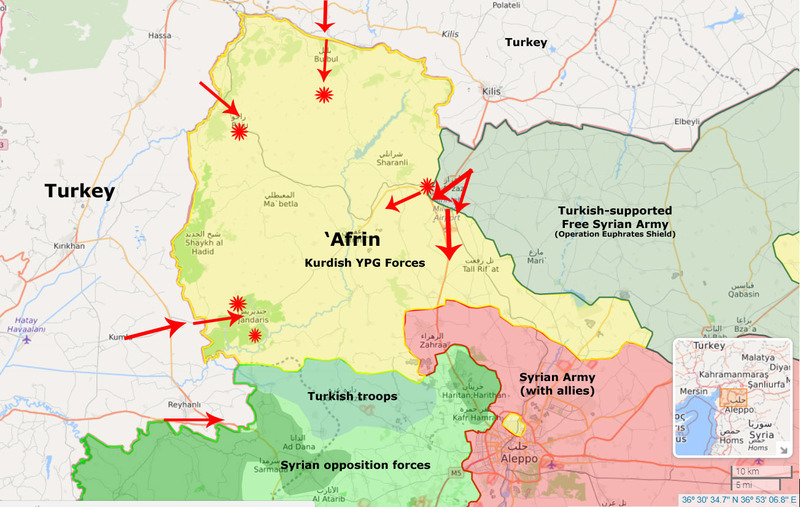 Watch what happens after 'Afrin. I think a move on Manbij is highly likely, but will the Turks cross the Euphrates and try to move east? If so, there could be direct confrontation between two NATO allies.